In order to construct a raised crosswalk on Cedar St. at the intersection with the newly expanded Community Path, the section of Cedar St. at the Community Path will be closed to all traffic from Mon., June 15, through approximately Fri., June 19. Work will be conducted between the hours of 7 a.m. and 7 p.m.; however, this section of Cedar St. will remain closed at all times during this time period to allow the structure to properly set. Please follow posted detour signs. The newest section of the Community Path between Cedar St. and Lowell St. is expected to open in July. The Community Path between Cedar and Lowell may be "officially" opening next month, but for months since construction had stopped, it has been consistently used every day. Since it runs parallel to Maxwell's Green, there have been many people walking their dogs along this "unofficial" section of the path, sometimes letting them run off-leash. Cyclists have also been using it. 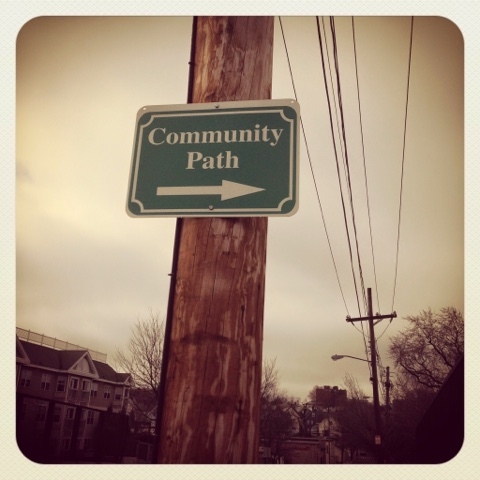 Why they put a sign up on Lowell Street to indicate the "community path" and thought nobody would be using it yet is a mystery. I live on the other side of the new path and I can tell you that it's being used right now, and not by just one or two people. I thought it had already been opened because of the constant use. I hope there will be enough signs warning people while they are raising the crosswalk, but judging from the way the new path has been constantly used, it may have little impact. One by-product of the Cedar Street closing. Drivers using Lowell Street as an alternative, particulary during the commuting hours, has done what traffic enforcement hasn't been able to do, speeders are virtually non-existant because of the bumper to bumper traffic created by the enhanced volume of vehicles that normally would use Cedar. Just because traffic is heavy, that doesn't necessarily deter speeders at all. I have often had to slow my car to a crawl while an oncoming car is speeding past me on Lowell. The fact that traffic will be heavier means that cars who see an opening will speed even more to try and get through. In the long run, heavy traffic won't be the solution to this problem. Putting speed bumps along some of these roads, along with better police details might go a long way to enhance safety. According to the radio and TV traffic reports during morning and late day commutes on the major roads in the area hardly a vehicle, if any at all, are speeding. You stated.. "I have often had to slow my car to a crawl.......on Lowell Street." So do other drivers intent on speeding. "openings" in heavy traffic are of a short duration, and few and far between particularly on city streets. Not to say I don't agree that more enforcement methods on Lowell Street during normal times are needed. But we all have to remember one thing; speeding is not just localized on Lowell Street. Speeders are virtually on every street in Somerville; and elsewhere. On my street some residents with small children are very upset about speeders on the street; but guess what, through personal observation, some of these very same mothers/fathers are guilty of the same thing. Speeding is definitely an issue everywhere, not even just Somerville. It just becomes a greater danger when the roads are not wide enough to move safely, and it's on those particular roads that stronger measures should be taken to prevent speeding. On Lowell Street, there's a radar sign showing you your speed as you approach. Do they really think speeders don't know they're speeding? I don't think it's going to make much of a difference. Signs rarely do with those who don't care. I know some people may not realize they're going faster than they should, but the people who will actually obey these signs (not to mention Stop signs and other similar signage) are the ones who usually obey the rules in the first place. Those who feel speed limits don't apply to them aren't going to obey signs anyway. I've often seen cars ignore Stop signs. I know that every street can't be policed to prevent speeding issues. But if there were at least physical measures put in place in problem areas, such as speed bumps, it would force bad drivers to slow down. I live on a street that is one side of a fork in the road, and cars often come swinging around the curve onto our street. Cyclists and children also pass on this street, so a speed bump at the curve would go a long way to helping avoid a tragedy. It's just a sad fact that usually things aren't changed for the better until someone is hurt or killed. So poster #3 above..."often had to slow to a crawl while an oncoming car is speeding past me on Lowell." Dated Tuesday, June 16th when cleared for posting here. The use of the word "often" tells me the described scenario just didn't happen since the detour was in place this past Monday. Having had to "slow" to a crawl during normal traffic times meana all other vehicles behind the subject's vehicle also had to slow down. was within their own travel lane; and you were within your own travel lane going in the opposite direction, don't see where needing to slow to a crawl was needed. Lucky your car was not rear-ended by the vehicle behind you. Speed bumps are all well and good; but one problem, as pointed out by a citizen/firefighter at one of the meetings at the VNA. He drives a fire-truck! He stated: Both he and the truck take a pretty nasty shaken up when hitting a speed-bump. Same goes for all other emergency vehicles; including ambulances when transporting a person needing emergency medical care; or responding to a call for aid where every second counts getting a person to a hospital. The two recent speed bumps put on Lake Shore have signs warning drivers that there are speed bumps ahead. when that front blade hits a speed bump. Lake Shore Drive does have a warning sign telling a driver there is a bump ahead, but the warning is for those drivers negotiating the curve coming off the bridge turning right onto Lake Shore Drive. The warning sign due to the speed bump being so close to that exit curve. It's noted, the newly placed speed bump on Cedar Street (Community Path) has no signs advising a speed bump is dead ahead. Speed bump warning signs are also helpful in another respect; it allows a driver to slow down gradually before his/her front wheels touch the front "ramp" to a bump. I was told by a mechanic that hittting a ramp to a speed bump while applying the brakes, mechnically, is not a good thing to do; almost tantamount to hitting a curb. Not good for your brakes and not good for your front wheels. I noticed the latest speed-bumps put down in Somerville (Cedar and Lake Shore Drive) do have ramp approaches and ramp exits that are extended so as not to create an angle that will jar your teeth. Years ago, on Rindge Avenue in Cambridge, there were speed-bumps with such bad angle approaches and exits that would knock the false teeth out of a person's mouth.